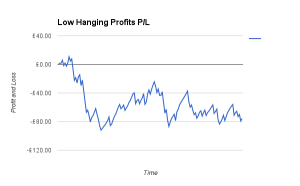 The Low Hanging Profits service is a daily email advisory service offering bets across a vast range of sports such as Football, Horse Racing, Cricket, Rugby and Snooker 7 days a week. Promoted by the reputable Betting Gods outlet, this service proposes to send out around 25 to 35 selections per month via email each afternoon between noon and 5pm, well in time to get the bets on. We are advised that a betting bank of 75pts is set aside to follow the service whose selections have variable stakes of 2 to 10pts for their bets. Since the 1st May launch this year, I've been keeping an eye on Low Hanging Profits (LHP for short) and in that time they have advised 146 bets for total stakes of 1024pts. So we're looking at around 7pts per bet. 109 of the 146 have won, producing profits of 115.14pts at an ROI of 11.24% from a strike rate of 74.5%. A subscription to LHP is currently priced at £24.95 per month, but there are substantial discounts for those signing up for longer periods, as a quarterly subscription is offered at £59.95, saving you approx. 20% over the quarter. Best Value, of course, would be a lifetime sub at £219.95 (less than 9 x the monthly fee) AND Geegeez readers can take 30 days for just £1 via this link and it's worth noting that as all payments are handled via Clickbank, a full 60-day, no-quibble, money-back guarantee is offered. David Sutton will now follow the fortunes of LHP for the next 60 betting days, using a £1.50 per point stake to even the bets out to around our nominal £10 stake and we'll report back on a daily basis. It doesn't take much working out that the trial of Low Hanging Profits was a dismal failure. It finished at a loss, the strike rate was nowhere near that previously claimed, the A/E stat was 0.95 which shows no value in the selections for the strike rate produced and it simply didn't produce the goods. The graph of profit and loss gives some indication of what a disastrous start the review had. By the end of Day 14, the loss stood at £89.63 which at £1.50 per point is massive 59 points. It would take a miracle recovery to get that back with the modus operandi of LHP. It didn't and would have had better luck with fish, a loaf of bread and 500 people. LHP goes for the steady trickle of profit from odds on selections but regularly, one losing bet wiped out any profit from other winners. It just couldn't produce the strike rate it needed to be profitable. In a nutshell, the service just didn't perform over these 60 days and I'd also question how attractive such a service can be even if it was revisited at a later date. For those of you who may giving LHP some thought - it's not my recommendation you do so - the best performing sports (with volume) were Snooker and Rugby Union. The ones to avoid were Football and Cricket. You get the usual Betting Gods service and guarantees and the emails are delivered consistently and on time. Everything is done professionally and the impression is of a hard-working individual trying to eke out profit as best he/she can. It may be misfortune during this trial review so if you consider the claims at the top of the page and deduct the results from the review, you still have a profit. It works out to approx. 11 points of profit a month (65 points for 6 months - this is very much an estimation). The best offer is the lifetime subscription so, at the rate calculated above and with £1.50/point, you'd still take over 12 months to recoup that expense. If that's your style maybe, just maybe, you could look into it a bit more. And that Ladies and gentlemen, is as postive as the review is going to get about Low Hanging Profits.